The Gestalt approach is based on the philosophy that the human being is born with the healthy ability to regulate needs and wants in relationship with the environment in which she/he lives. Heightening of personal awareness and exploration of needs is enabled by the therapist who actively engages in supporting and assisting the therapeutic journey of the client. 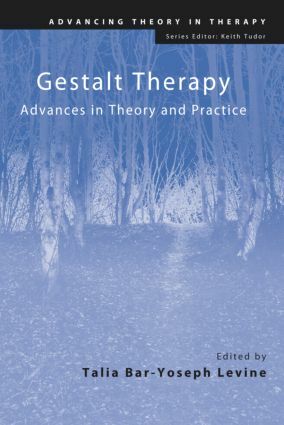 Gestalt Therapy: Advances in Theory and Practice is a collaboration of some of the best thinkers in the Gestalt therapy approach. It offers a summary of recent advances in theory and practice, and novel ideas for future development. Each chapter focuses on a different element of the Gestalt approach and, with contributors from around the world, each offers a different perspective of its ongoing evolution in relation to politics, religion and philosophy. Incorporating ideas about community, field theory, family and couple therapy, politics and spirituality, this book will be of interest not only to Gestalt therapists but also to non-Gestalt practitioners, counsellors, psychologists, psychiatrists and other mental health professionals. Counselling, behavioural science and psychotherapy students will also find this a valuable contribution to their learning. Preface, Tudor. Introduction, Levine. Gestalt in the new age, Levin and Levine. Flexibility in Theory Formation: Point and Counterpoint, Polster. Reconsidering Holism in Gestalt Therapy: A Bridge Too Far?, Bowman. The Interactive Field: Gestalt therapy as an embodied relational dialogue, Clemmens. Personality: Co-Creating a Dynamic Symphony, Bandín. Critiquing Projection: Supporting Dialogue in a Post Cartesian World, Jacobs. Sensing Animals/Knowing Persons: A Challenge to Some Basic Ideas in Gestalt Therapy, Bloom. Mind and Matter: The implications of Neuroscience Research for Gestalt Psychotherapy, Philippson. Spirituality in Gestalt Therapy. Brownell. Creating an Embodied, Authentic Self: Integrating mindfulness with psychotherapy when working with trauma, Sapriel. The Four Relationships of Gestalt Therapy Couples Work, Yontef. Gestalt Family Therapy – A Field Perspective, O’Neill. A Neo-Lewinian Perspective on Gestalt Group Facilitation, Gaffney. Awareness instead of rules: Gestalt ethics, Knijff. Culture Change – Conversations Concerning Political/Religious Differences, Lichtenberg. Talia Bar-Yoseph Levine B.A., M.A. (Hons. ), D. Psych. is a co-founder of the Jerusalem Gestalt Institute; past head of the M.Sc. programme in Gestalt psychotherapy at Metanoia Institute, London; registered clinical psychologist since 1981. Talia is a business consultant in Israel, Europe, USA and Asia and an international trainer. She has published numerous journal essays and is a member of the IPA (Israeli Psychological Association).